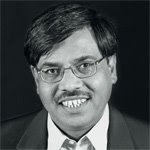 Haq's Musings: Pakistanis Join Hunt for "God Particle"
Humans have been engaged in the perennial effort to crack the code of the physical world; to figure out what the universe is made of; to know the origins of human and other species; in other words, to get to the very bottom of things. These are existential questions that religions and philosophers have offered answers to. But most scientists remain unconvinced with these answers and continue their hunt for "God Particle". The most high-profile effort to find "God Particle" is taking place about 300 ft below ground in a tunnel at the French-Swiss border. Buried there is a massive particle accelerator and super collider called LHC (Large Hadron Collider) run by the Swiss lab CERN (European Organization of Nuclear Research), which has two beams of particles racing at nearly the speed of light in opposite directions and the resulting particles produced from collisions are being detected by massive detectors in the hope of experimentally finding the fundamental particle of which everything in the universe is built from: God Particle. The knowledge gained from this multibillion-dollar atom smasher may eventually help scientists treat diseases, improve the Internet, and open doors to travel through extra dimensions, according to the scientists associated with it. In addition to the 27 scientists, Pakistan has made material contributions to the tune of $10m. According to a post by Ujmi on WTF, Pakistan signed an agreement with CERN which doubled the Pakistani contribution from one to two million Swiss francs. And with this new agreement Pakistan started construction of the resistive plate chambers required for the CMS muon system. While more recently, a protocol has been signed enhancing Pakistan’s total contribution to the LHC program to $10 million. 11. 245 of the 300 CMS chambers required were made in Islamabad, of which 226 are already installed at CERN. There have been many other efforts to build particle accelerators and supercolliders including SLAC (Stanford Linear Accelerator) and Fermi Collider, but none so ambitious and massive as the LHC. It is a commendable effort that will advance human knowledge. However, there is no guarantee that it will help find "God Particle". Its a shame the experiment has been delayed several months due to a malfunction.I really want to know how everything we know came to be. This surely is an extremely informative post and a heartening one too. Being a part of the domain of science and technology, I certainly feel proud of the sort of contribution our country is making in this historic experiment. The important thing is to stay involved in leading research and business activities with other more developed nations. Results will surely and eventually come, regardless of whether we live to see them or not. The seeds must be sown NOW. In spite of the ineptitude of our political leadership and rampant corruption in our nation, Pakistanis seem to find a way to get involved in all kinds of research and science from Antarctica to Switzerland to North Pole. Many have started successful high-tech companies in US that have gone public. Tell me which components has Pakistan made for CERN? Anon: "Tell me which components has Pakistan made for CERN?" 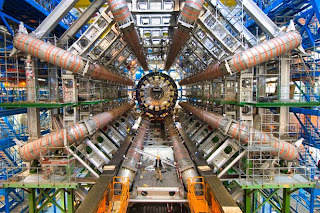 Could you please write something about the God Particle from CERN? Is the Science entering God’s territory now, a job man wanted to do from ages and always failed? A sub atomic particle 60 Nano seconds faster than Light, turns Einstein in his grave, and makes time travel possible. Or you will say it just proves that science was always wrong. MZ: "Could you please write something about the God Particle from CERN?" If it's indeed true, then I'm just glad Pakistani scientists at CERN helped find it. GENEVA -- A pillar of physics -- that nothing can go faster than the speed of light -- appears to be smashed by an oddball subatomic particle that has apparently made a giant end run around Albert Einstein's theories. Scientists at the world's largest physics lab said Thursday they have clocked neutrinos traveling faster than light. That's something that according to Einstein's 1905 special theory of relativity -- the famous E (equals) mc2 equation -- just doesn't happen. "The feeling that most people have is this can't be right, this can't be real," said James Gillies, a spokesman for the European Organization for Nuclear Research. The organization, known as CERN, hosted part of the experiment, which is unrelated to the massive $10 billion Large Hadron Collider also located at the site. "They are inviting the broader physics community to look at what they've done and really scrutinize it in great detail, and ideally for someone elsewhere in the world to repeat the measurements," he said Thursday. no doubt about that -- if it's true." Other outside scientists expressed skepticism at CERN's claim that the neutrinos -- one of the strangest well-known particles in physics -- were observed smashing past the cosmic speed barrier of 186,282 miles per second (299,792 kilometers per second). University of Maryland physics department chairman Drew Baden called it "a flying carpet," something that was too fantastic to be believable. "We have not found any instrumental effect that could explain the result of the measurement," said Antonio Ereditato, a physicist at the University of Bern, Switzerland, who was involved in the experiment known as OPERA. A similar neutrino experiment at Fermilab near Chicago would be capable of running the tests, said Stavros Katsanevas, the deputy director of France's National Institute for Nuclear and Particle Physics Research. The institute collaborated with Italy's Gran Sasso National Laboratory for the experiment at CERN. Einstein's special relativity theory that says energy equals mass times the speed of light squared underlies "pretty much everything in modern physics," said John Ellis, a theoretical physicist at CERN who was not involved in the experiment. "It has worked perfectly up until now." As they hail Pakistan's first comprehensive national science, technology and innovation (ST&I) policy, the country's science leaders are hopeful of effective implementation and funding. The 'National Science, Technology and Innovation Policy–2012', launched last month (23 November) with support from the Pakistan Council for Science and Technology and the ministry of science and technology, is expected to help Pakistan emerge as a scientifically sensitive nation. Describing the policy, at the launch, as "demand-driven and people-centric ", Changez Khan Jamali, federal minister for science and technology, said it was a milestone in Pakistan's self-reliant development strategy. Jamali said the new policy was focused on improving the quality of life for common people through the creation of a conducive industrial and economic environment. Pakistan has an ambitious plan to increase its science budget to 1 and 2 per cent of annual gross domestic product spending by 2015 and 2020 respectively, against the present 0.6 per cent. Akhlaq Ahmed Tarar, secretary in the ministry, told SciDev.Net that he looked forward to "having close to 1 per cent allocation in the 2013 budget." "The only fuel to make this policy a success is real political and fiscal support, which government is committed to provide – so there are hopes for an innovative and technologically advanced future for Pakistan," Tarar said. A national policy for ST&I has been in the making since 1960 when the National Science Commission of Pakistan was constituted and tasked with finding ways to promote scientific research. However, various hurdles stood in the way, the chief among them in more recent years being funding cuts forced by the recession and natural disasters. The new policy focuses on environment science, biotechnology, energy, water, minerals, ocean-sciences and engineering as critical areas demanding priority. It recognises innovation as an integral part of the S&T system while emphasising development of human resources, training and education. Manzoor Soomro, chairman of the Pakistan Science Foundation, an autonomous body under the science ministry, told SciDev.Net that to make the new policy serve the country's socio-economic development better, public-private partnerships and academia-industry linkages would need to be forged. "Higher Education Commission and the well-developed offices of research, innovation and commercialisation that already maintain R&D links with different public-private organisations, would be the beneficiaries of this policy," Soomro said.